Villa UJV 137, also knonw as Villa Barthélémy, is a well-positioned villa located high above Gustavia Harbor in St Barts. 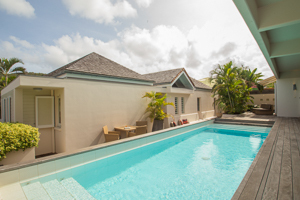 Villa UJV 137 consists of three bungalows offering eight bedrooms, all with ensuite bathrooms. Three of the bedrooms are twin bedded, which makes this villa perfect for families traveling with children and nannies. Surrounded by a large wooden deck, villa UJV 137 offers several sunny and shady areas as well as a large swimming pool. There is a fully equipped kitchen in the main house and a sitting area, offering plenty of room for a large group of people.